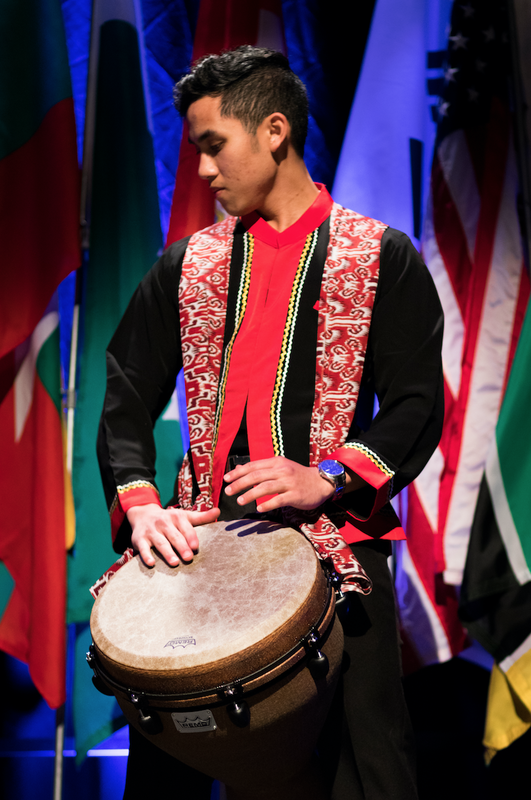 For many at Messiah, the annual International Banquet is a precious opportunity to commemorate the myriad of cultures and backgrounds represented on campus. This year’s ceremony ‘The Golden Globe’ made a new approach of meditating on home and identity while maintaining its custom of showcasing traditional foods, songs, dances and garb. The evening opened with a flag procession accompanied by musicians playing ‘We are one’, ‘Waving flag’, and ‘We are the world’. Many cheered for their friends’ country flags as well as their own, capturing the atmosphere of mutual respect and international solidarity. 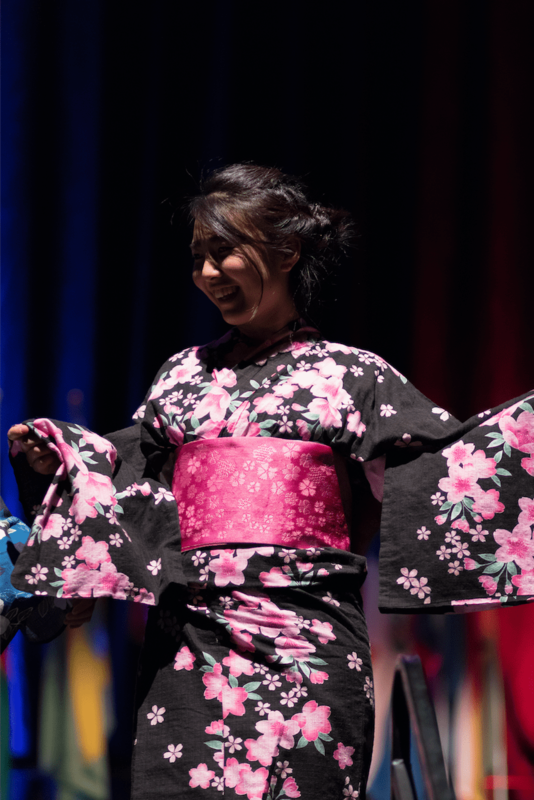 “For one night in the entire year, the Banquet serves for international students, and ethnic minorities to have more control in representing themselves and their complexities through art,” ISA coordinator Junmey Wang said. Luiza Cliver, Assistant Director of International Student Program, prayed over the evening, and the emcees, Gloria Igihozo and Kavin Raj, dismissed tables to the buffet stations. Courtesy of Catering Services, there were several decks of Middle Eastern Shawarma, African beef stew, Indian Basmati rice, cheese balls, samosas and Greek salad. Entertainment followed soon after. 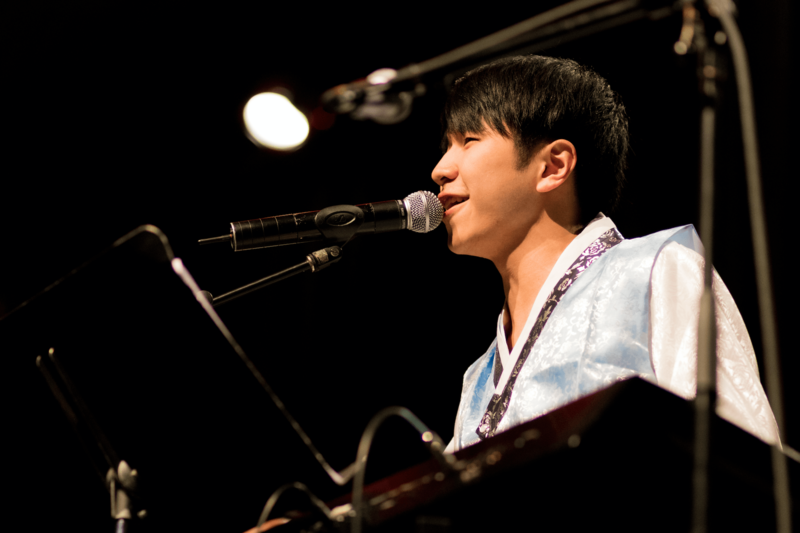 First, Joshua Song and Siyamthanda Joja sang ‘Bogoshipda’, which is Korean for ‘I miss them.’ It began with a soulful feel, which gave way to a more upbeat tune, reminding the audience that missing someone, or something, isn’t always melancholy. Next, Igihozo spoke on the 1994 genocide that befell her home, Rwanda. “When the international community keeps silent on matters like this, we fall and perish,” she said, before tributing a Kinyarwanda dance with Keza Nzisabira, Pepita Uwineza and Laura Sindabizera. “With this homage, I am not saying I am a survivor, I am proclaiming ‘Never again’.” Igihozo declared. For her cover song ‘Quimbara’, Lisette Acosta invited anyone to accompany her onstage, and a number of talented students danced the salsa while she sang. After that, Desi Girls Fatimah Jan, Ashley Mathew and Sima Zian, led by Abigail Kazee, graced the audience with fluid South Asian choreography. “As a freshman, I think it’s such an honor to represent my country and my people. I hope that people can continue to learn and celebrate,” said Jan, who has Pakistani origins. As the evening progressed, student groups BSU and ASU showcased an Afro-Caribbean dance to demonstrate the music-and-dance oriented culture regularly enjoyed in the Caribbean. Donnell Mcnair, Leiby Soto, America Cervantes and Karrington Washington followed it up with Dominican ‘Merengue Típico’. The Malaysian community delivered two performances in one sitting: Dikir Barat, a musical form where everyone sits, sings and keeps percussive rhythm with their hands, and an indigenous Dayak welcome dance. Igihozo and Raj swung the Banquet around to a more contemplative mood. ‘What is home?’, they asked the audience. ‘What is identity?’ They played a video featuring certain international and MK (Missionary Kid) students who shared their thoughts on the subject. “Having an open mind, making new friends and learning about your new surroundings helps ease the difficulty of moving away from your family and where you grew up,” said Kenyan Maluki Mbesa, one of those in the video. The video transitioned into a final dance; a rhythmic gathering of sorts. Many individuals and student groups had choreographed short sequences that seamlessly flowed into each other. The song ‘This is Me’ blared in the background as a flash mob gathered along the carpet and the stage, complete with none other than Kevin Villegas, director of Student Involvement. The hall was rife with cultural and national pride. The Fashion Show was another Banquet favorite. Many lined up to display their traditional dress as the emcees introduced them, and a slideshow listed brief notes on each outfit. Soon, this gave way to Senior Appreciation bidding farewell to international and MK seniors, shortly followed by the nomination of a new ISA/Mukappa cabinet. And with that, another beautiful evening of community and diversity appreciation drew to a close.